Did you know that in addition to sharing photos, videos and text posts, WhatsApp also allows you to share animated GIFs to your Status? Our guide will show you how this works. Step 1: Tap “Status” in the bottom-left corner of the screen. Step 2: Tap the camera icon to go to open the Status camera. Step 3: Tap the photos icon in the bottom-left corner of the screen. Step 4: Tap “GIF” in the bottom-left corner of the screen. 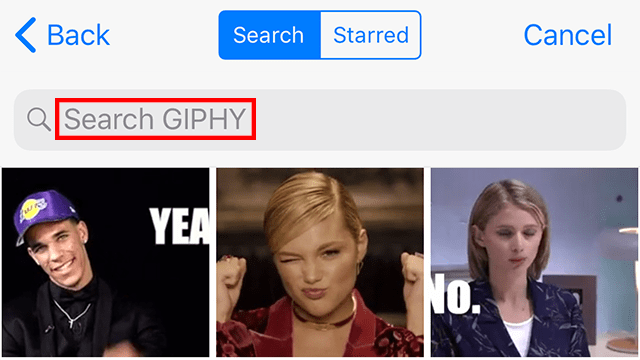 Step 5: Either scroll through the GIFs that WhatsApp presents you with and tap one to add it to your post, or tap “Search Giphy” near the top of the screen to search for a GIF manually. Step 6: If you searched for a GIF, scroll through the search results and tap a GIF to add it to your post. 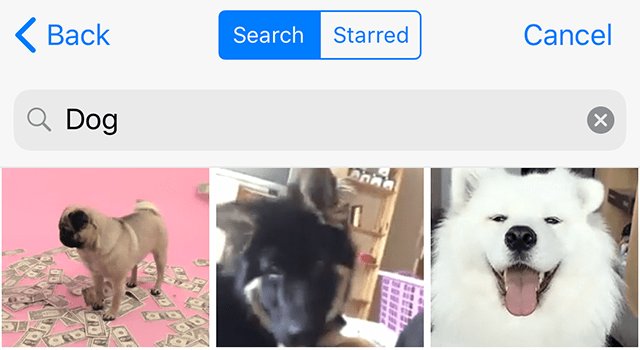 You can also tap the “x” icon at the right side of the search bar to search for something else until you’ve found a GIF you want to share. Note: You can tap and hold on a GIF to “star” it, adding it to your “Starred” section. This will allow you to quickly share the GIF again if you ever want to. Step 7 (optional): Once you’ve selected a GIF, you have the option to make its animation loop shorter. 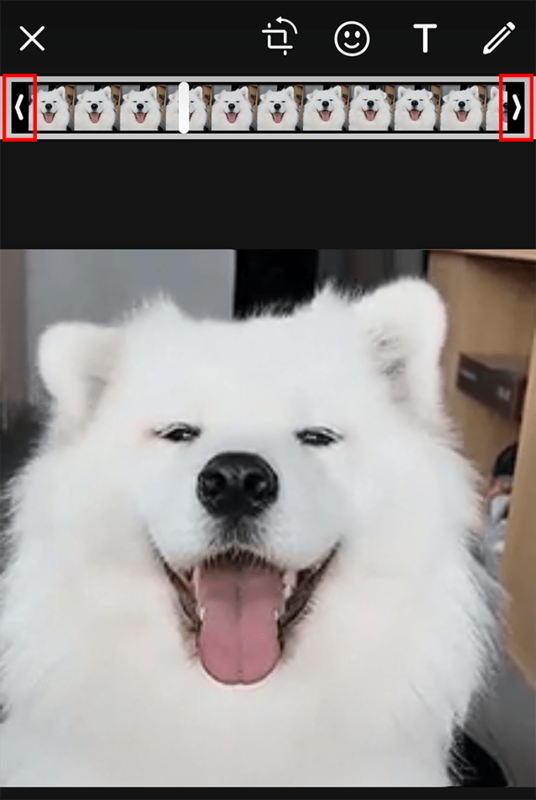 If you want to do this, drag the arrows on the slider at the top of the screen toward the center of the screen to trim off part of the GIF’s beginning and/or end, until it’s the length you want it to be. 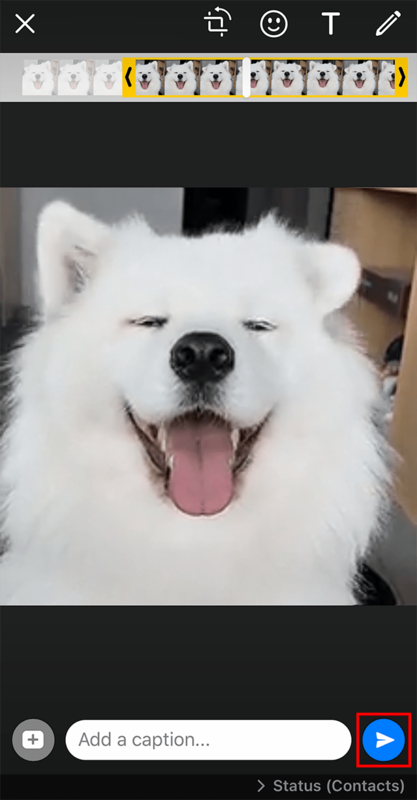 Step 8 (optional): Once you’ve altered the length of the GIF, you can also choose which portion of the GIF will play by dragging the entire slider to highlight the section you want to play. Step 9: When you’re done editing your post (you have the option to add things like a caption and stickers), tap the arrow in the bottom-right corner of the screen to share the post to your Status. Note: You can also tap the “+” icon in the bottom-left corner of the screen to select and edit another GIF. If you do this, each GIF will be shared as a separate Status post, and they’ll each disappear after 24 hours. Also note, if you’ve chosen more than one GIF and then change your mind about sharing one (or more) of them, you can delete all but one of the GIFs you’ve chosen by tapping and holding on one of the GIF’s icons in the bottom-left corner of the screen until the icons start to wiggle. From there, drag the GIF(s) you want to delete upward to remove it/them. This method will also allow you to change the order in which the GIFs will be shared.